My name is Jennifer Italiano and I’m the co-founder and Co- Chief Operating Officer of Live Organic Food Restaurants & Products. The business was launched in 2002 as an organic four-seater juice bar but has since grown into full service and take-out restaurants and a 17 000 square foot food production facility providing some of Canada’s major retail outlets with plant-based, organic, gluten and refined sugar-free organic products. As COO my days are involved in most strategic aspects of the business as well as sales, product recipe development and restaurant over-sight. Despite starting out my career in the fashion industry, I have always been a true ‘foodie’ and loved playing in the kitchen with organic, whole and raw food. Sixteen (16) years on, I can truly say that this love continues and my passion for the industry is just as strong as it was when we entered it in 2002. 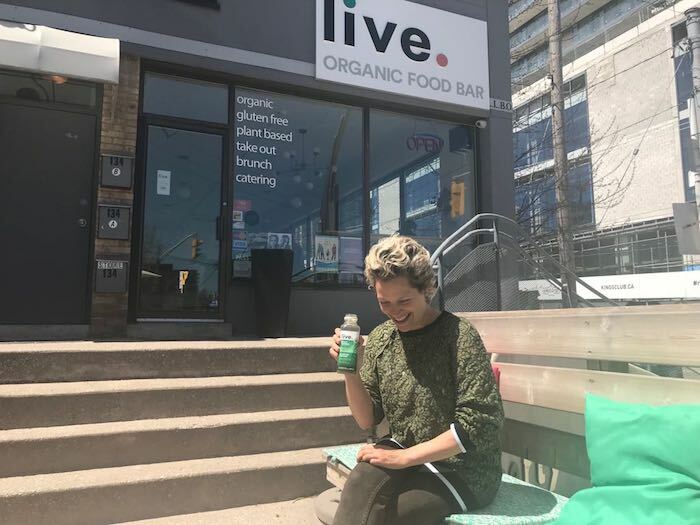 When did you start Live Organic Food Bar? Live Organic food bar started in 2002 as a four-seater organic juice bar with four menu items that were all organic and raw vegan. To be brutally honest, I kind of fell into it. I took a leave of absence from the crazy fashion industry and started concentrating my time and energy on discovering new healthy diets and recipes. This led to me helping out in a kitchen of the juice bar and within a few months I took over the café, and the rest is history as they say. What are some tips you can give for eating healthy whilst living a busy lifestyle? My biggest tip would be to always have something green in your diet every day, whether that’s a green juice or a super green smoothie it doesn’t matter, just make sure you have it. I’m a big believer in making fresh green juice or superfood green smoothies. They are easy and fast and can be transported with you in your daily life. My next big tip would be to have whole foods in your fridge and pantry so you’ve always got good food choices on hand. And lastly, plan your meals ahead, you don’t want to be running around being stressed about what to eat. This can often lead to taking the easiest route with something that’s not quite as good for you as it should be. What is your favourite item from the Live Organic Food Bar menu? That’s a difficult one. I’m going to have to say that I’m still a huge fan of our raw combo. It’s a dish that’s been around since the beginning and even though the components change you always get a variety of food. After saying that, I have to admit that I’m currently obsessed with our warm lentil salad and the burdock burrito. They are both just hitting the spot these days. What is something your customers may not know about Live Organic Food Bar? Funny enough, there are people who are unaware that we create a full product line in our Live Organic’s 17000 square foot food production facility. This produces our products which are sold and available in large brand retail outlets throughout the GTA, Montreal, and Calgary. They don’t put the restaurants together with the product lines we create for retail sale. What do you enjoy most about working at one of Toronto’s favourite healthy restaurants? Having been in the industry for over 16 years I have to say that I still love being surrounded by healthy, beautiful food every day. It may sound trite but it really does inspire my diet choices. It’s also great to have some amazing staff that we call upon at our restaurants and food production facility. We all know that without them nothing happens.